If you’ve always wanted a warm and cosy sleeping bag for your caravanning holidays then you’ll love our exclusive Duvalay discount code, just in time for Christmas. We’ve secured a 15% discount off their award-winning sleeping bags, which combine a duvet and gold memory foam bed topper all-in-one, keeping you snug and comfy on your caravan, motorhome or camping trips. So, don’t miss out on this special offer to get yourself, a loved one, or a caravanning friend, a luxury Duvalay sleeping bag in time for Christmas! Simply visit www.duvalay.co.uk and enter the code CGNOV15 at the checkout. The Duvalay sleeping bags are great if space is limited and come in four colours to match your interior scheme. Simply unbuckle the straps and unroll your sleeping bag when it’s time for bed. They can be used on any surface as the memory foam topper will give you that extra comfort and two singles put together will make up a double. Duvalay are also known for their hypoallergenic Duvalite caravan and motorhome mattresses, which are fitted to all Swift Group caravans, motorhomes and holiday homes. 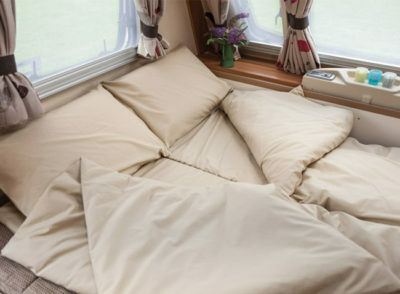 Their product range includes portable and bespoke mattress-toppers, bed toppers, mattresses, bedding and pillows for a great night’s sleeping in a motorhome and caravan. Offer code expires midnight 18th December 2016. 15% discount only applies to Duvalay sleeping bags and does not include other products or accessories, such as bags and spare covers. Not available in conjunction with other offers. The closing date on your competition for duvalay sleeping bags is jone 2016 it is now November !!!! Hi Norma. The competition to win Duvalay sleeping bags is now closed – we drew the winner in June (http://www.caravanguard.co.uk/news/win-two-luxury-sleeping-bags-duvalay-10970/) We now have a 15% discount code until mid December.